Before I bought these $300+ Zamberlan Boots (above), I wore Merrell Moab 2 Boots to hike in. I was reasonably happy with the switch to Zamberlan until my 2016 southwest hiking they gave me problems. Well, I thought my problem was a new issue but it wasn't. What I found was that hiking the mountains around Tucson and Phoenix with the Zamberlan Boots the soles of the shoes did not bend and caused the heal of my foot to rise up out of the heal pocket and then back down, causing blisters. This happened when I hiked over 2 miles of elevation. Around home I generally did not climb inclines over 2 miles continuously up. See the problem is that Zamberlan sells widths for wide or regular and not narrow width. The problem is with my feet being too narrow. I wear a size 13 AAA and my foot is just too narrow to fill the heal void on boots. I can pocket my heal and tie the boot nice and tight but my heal will still move up and down with a shoe sole that does not bend. Narrow hiking boots are nearly non existent and the reason I went to the Italian boot company Zamberlan was they are generally narrower. Without a doubt I had found my problem and it was me. Way too narrow of a foot for boots that are sold. I decided to go to various hiking stores and ask questions and I was told the Merrell Moab Rover M (medium) was a bit narrower than the rest. Above are my first pair of Merrell Moab Rover hikers size 13 M. They fit much better in the heal pocket than others and after I used them, I wasn't getting blisters. I attribute this to the fact that the sole of the shoe bends and doesn't cause the heel to rise up out of the pocket nearly as much. 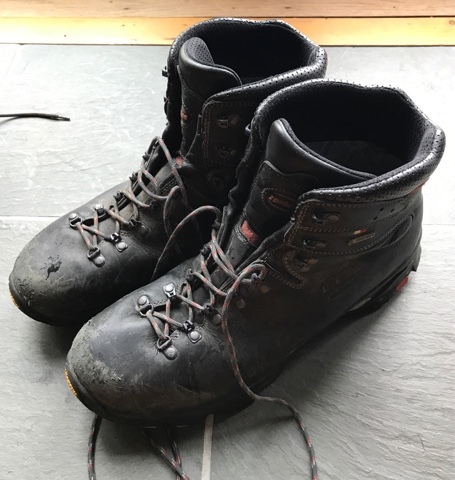 When I was in San Diego this winter, after knowing I was going to Havasu Falls, I called in an order for a second pair of these boots as you can see they do not hold up as long as the heavier Zamberlan boots do. To make these Merrell Moab boots more comfortable, I replaced the innersole with the Dr. Scholl's massaging gel. 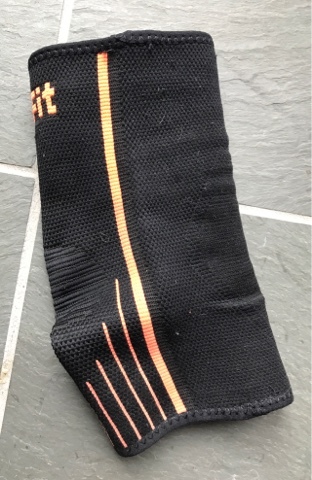 This improved comfort and absorbed some of the compression that exists descending. When I tie these Merrill Moab Rover boots after they are broken in the laces eventually pull both sides of the shoe together. This is because I have a narrow foot in a medium width boot. I searched for an answer to this and found Osfit-Best Ankle Brace (above) for Arch and Ankle on Amazon. They slide on over my sock and for me it helps in two ways. First it helps fill any void in the heal area once tied and it allows me to get my boots tied tight when broken in so the laces don't pull the sides of the shoe together to touch. Since I have found a this ankle brace that pockets my heal I can now try the Zamberlan boot again with it and see if it will protect from my heal rising out of the pocket and getting a blister. If that works then I will have found a solution for my real good hikers. - Sneakers are cheaper than boots. - Boots are heavy, sneakers have less swing weight on your feet. - Sneakers are generally mesh and when wet, they dry quickly as your feet are cranking heat and the water quick evaporates. 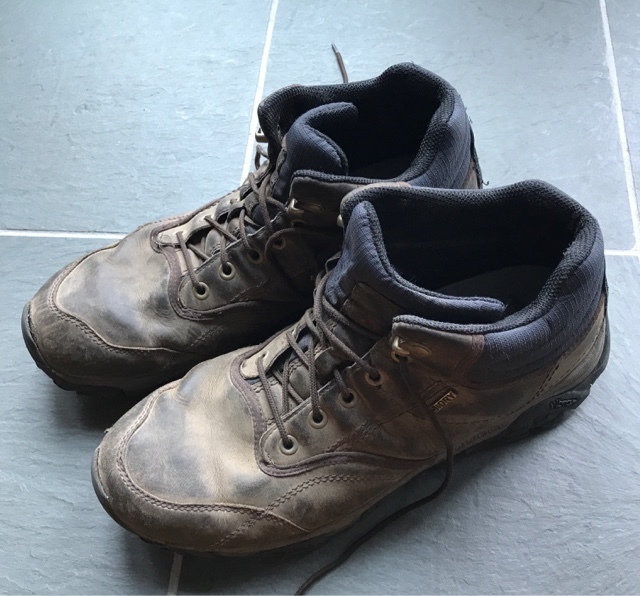 Boots, even if waterproof ones, eventually have water intrusion or you sweat them out from the inside and then your feet and wet/clammy and more susceptible to blisters. Have you checked out https://backpackinglight.com/ ??? You are right that need the ankle support and sneakers will not provide that even the high ones. Yes I have been to the backpacking light site, as it has been recommended to me from a couple followers. It's a good source to look at options. For me it. Ecame a balance on cost vs light vs what I needed. I made up for the weight of my boots with some smart cost effective purchases. In the end the weight didn't bother me.